Joseph Sill is the 9th great-grandfather of Richard, James, Gary, Lisa, Carl, Jane, Bruce, Cathy, Ron, Stacey, Matt and Sandy; and 10th great-grandfather of Asher, Owen, Caitlyn, Becky, Emily, Jack, Jill, Jordan, Mike and Brian. Joseph Sill was born in Newcastle-upon-Tyne, Northumberland, England, in 1636. He came to America with his parents, John and Joanna Fillbrook Sill, and sister Judith in 1637. The Sills settled in Cambridge Town, Massachusetts, where John had established a farm. Joseph married Jemima Belcher on December 5, 1660 in Cambridge Town. They had six children. Three of four sons died young; the fourth son, Thomas, survived, as did two daughters, Jemima and Elizabeth. Joseph Sill devoted a large portion of his life to military service. 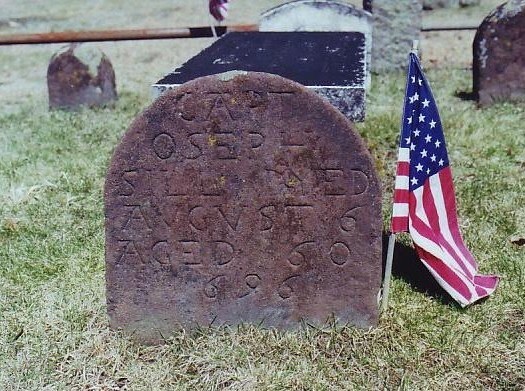 On the roster of officers of the first American army as organized for the Narragansett Colony, mustered at Pettaquamscutt, Rhode Island, December 19th, 1665, was the name of Captain Joseph Sill. Joseph served during the bloody King Philip’s War (1675-1678). 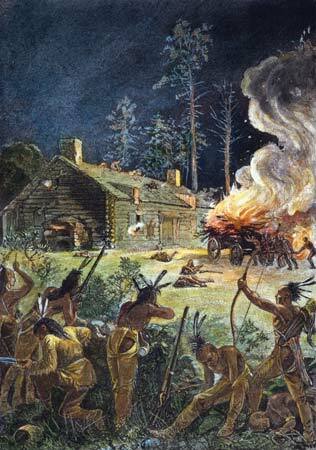 In February 1676 Joseph and his men captured 300 Indians. Another time Joseph, with a company of only fifty troopers, conducted a long train of wagons from Groton, Connecticut, to Boston, successfully fending off attacks along the way. At the close of King Philip’s war, Joseph petitioned the General Court, assembled at Boston, for a grant of land in return for his service in the military. Although he was awarded a tract of land, Joseph was convinced by friends, fearing retaliation from the Indians, to move away from the area. Joseph and his children – Jemima having died in 1675 – moved to an area north of Lyme, Connecticut, which came to be known as Silltown. His tract of land in Massachusetts was inherited by his daughter, Jemima. On February 12, 1677, Joseph married his second wife, Sarah Clark Marvin (1644-1715), widow of Lieutenant Reinhold Marvin, in Lyme, Connecticut. Joseph and Sarah had two sons: Joseph (our ancestor), born January 6, 1678, and Zechariah, born January 1, 1682. Sarah Clark is another double ancestor, for we are also descended from a son, John Marvin (c1664), from her first marriage. So, let’s sort this out: Joseph Sill is our 9th great-grandfather, Reinhold Marvin our 10th great-grandfather, and Sarah Clark is both our 9th and 10th great-grandmother. Thank goodness for genealogical computer software to keep all this straight! Joseph spent the remainder of his life as a farmer and an elected official. He died August 6, 1696, at the age of 60 and was buried in the Duck River Cemetery in Lyme. My name is Peter Sill. I am a descendant of this Joseph Sill.